“National emergency” becomes national joke, becomes national tragedy. The evolution of a disaster. Three weeks after the spectacular unraveling of the sugar tax in the UK, The Lancet reports that we are now on track to become the most obese country in Europe. At least we are good at something. We are also still waiting for the UK government’s Childhood Obesity Strategy which has been repeatedly delayed. I suspect that by the time it sees the light of day, many ofthe overweight children that it is supposed to help will have become obese adults. 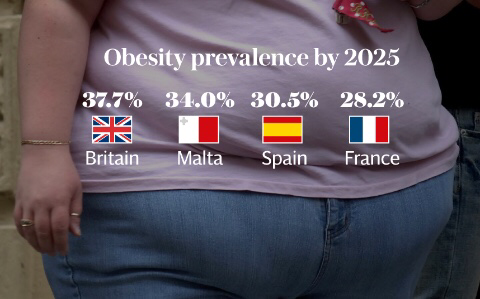 The Guardian is also carrying the story with a quite shocking graphic comparing the numbers of obese people with the number of underweight people in the world. Unfortunately I can’t copy it so if you want to be appalled you will have to go and look yourself. This table shows the obesity prevalence projection for 2025 and the probability of achieving the target of halting the rise of obesity compared to its 2010 level if post-2000 trends continue. That’s right… 0% probability of halting it. A generation of children destined to die before their parents. ← The TGU… is it worth it? Yes!